The other day I went over to Google and typed in “how to post affiliate links on Pinterest”… because I’ve been wanting to test this traffic source out for quite a while now. I was surprised at how little help the results were that I found on the first page of Google. Most of what I found was talking about Pinterest’s decision to allow affiliate links again back in May of 2016. Everything else I found basically told me to find an affiliate product to promote, pin the affiliate product’s page, and then go back and edit the URL of the pin and add my affiliate link. While that’s cool and everything… that limits what I can pin. I’m basically limited to pinning sales pages. Or, in the case of Amazon, I could pin a product page… except that Amazon doesn’t allow their affiliates to promote products on Pinterest. Dang. 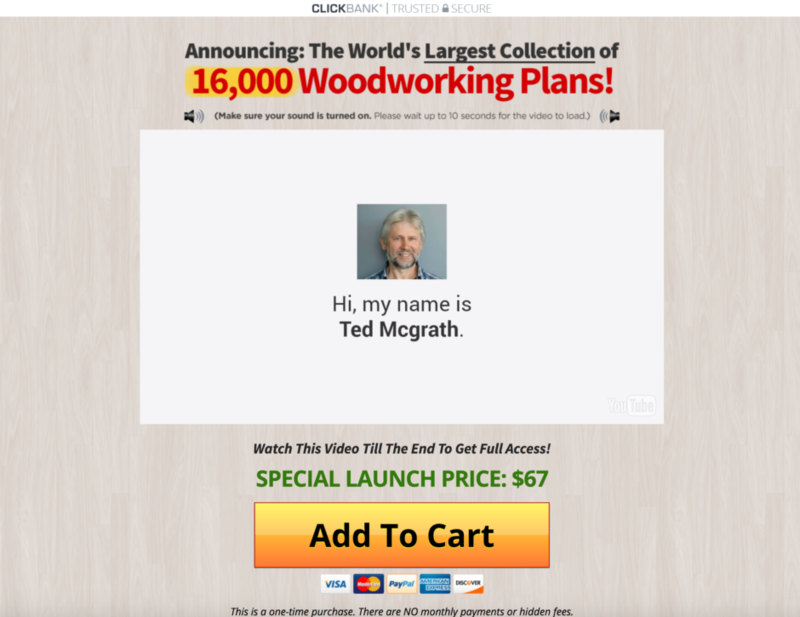 What if I wanted to promote a Clickbank product like, Ted’s Woodworking? How could I do that on Pinterest? I say “the old way” because I personally think my “new way” is so much better… even though “the old way” still works. Before I reveal my super-sneaky, awesome “new way”… let me walk you through “the old way” because I still suggest doing this too. 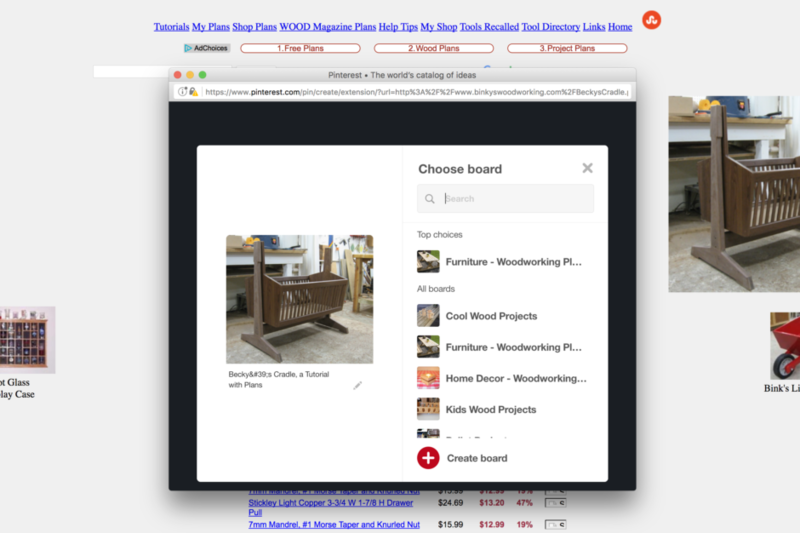 If you don’t already have the Pinterest browser button… you can get that here. It just makes it easier to pin stuff right from your browser window. Then, open up the sales page for the product you want to promote. In my case, I’m promoting Ted’s Woodworking so I’ll pull that page up. Now, I’ll click the Pin It browser button. I’ll choose the image on the top left as the one that’s displayed on my Pinterest board. I’ll pin this to the Furniture board and then view the pin. Now I’ll click the pencil icon at the top left to edit this pin. Now I’ll replace the existing product sales page link with my Clickbank affiliate link. Uh oh… guess you can’t post Clickbank affiliate links to Pinterest anymore. Dang. Bitly links don’t work either. If you have a WordPress site, you can use the free Pretty Link Lite plugin and create a cloaked affiliate link to use here. If you have no other way of creating a redirect link to cloak your Clickbank affiliate links… you’ll have to move on to my new method below. In the image above you can see the new pin I added where the red arrow is. It’s kinda like a native ad inside a bunch of other relevant content. When you click on that pin, a small window pops up giving you more info and if you click on the the Visit button… you’re taken to the sales page using my affiliate link (I created one using Pretty Link Lite from inside my WordPress site). Does this “old way” work? Yes, absolutely. It works good. But here’s the problem I have with it. On this one Pinterest board I have 23 different pins… one of them being a pin that includes my affiliate link. Which means, unless they visit that ONE site… I have no chance of earning any commissions. So, what happens when someone visits one of the other 22 sites? Nothing. Nothing at all happens. And that’s the problem. I’m basically sending free traffic to these other sites and getting nothing in return. What if I told you I found a way to put your Clickbank affiliate link (or any affiliate link for that matter) in front of every single person who visits each of the sites you pin? 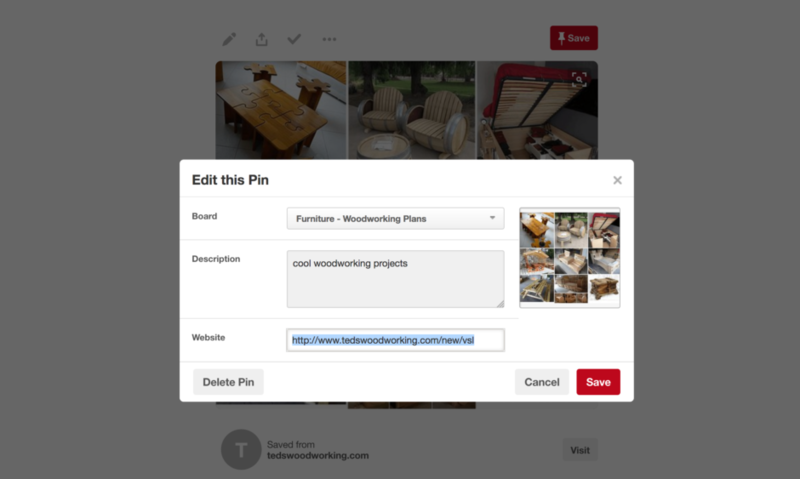 Introducing.. my “new way” to post affiliate links on Pinterest. After thinking for a few days about how I could maximize my efforts with free Pinterest traffic… a light bulb went off in my head. Just to confirm that my idea had legs… I put it to the test and set up a quick “dummy campaign”. My goal with this test wasn’t to make sales… it was to get clicks on my affiliate link. To prove that this method could drive free traffic to any Clickbank offer. So I set up a very small test just to see if it would work… and it did. I’ll walk you through the setup. It’s very similar to “the old way” above. Except you need to use a free online tool and there’s one extra step involved. UPDATE (FEBRUARY 21, 2018): Pinterest has now blocked Snip.ly links. So you’ll either have to have a paid Snip.ly account with your own custom domain or you can get this pretty cool tool that does the exact same thing. You’ll need to use Sniply for this to work. Sniply allows you to add an overlay over any page of any site you want online. Maybe you know where I’m going with this already. If not, keep reading. Adding the browser extension will save you time from jumping back and forth between browser tabs when you start pinning stuff. Here’s where it starts to get cool. You don’t need to pin sales pages any more. You can literally pin any page on the internet. NOTE: There are some sites that don’t allow frames and you therefore can’t use Sniply (but not many). In the image above you can see what it looks like when clicking the Snip browser extension. I set up a fake Pinterest profile and a fake Sniply account using the name Time Stone for this test. 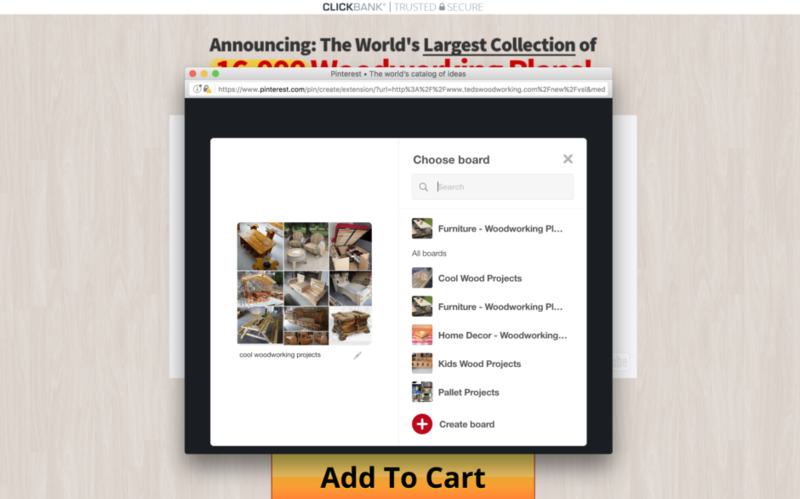 You can see in the bottom left corner of the web page there’s an overlay that includes a picture of “Tim Stone”, a headline that reads “Click Here to Download 16,000 Woodworking Plans!”, a button with a call-to-action of “Download Now”, and the URL is my uncloaked Clickbank link. When I’m happy with the overlay, I click the Snip button, and I’m given my new Sniply link. 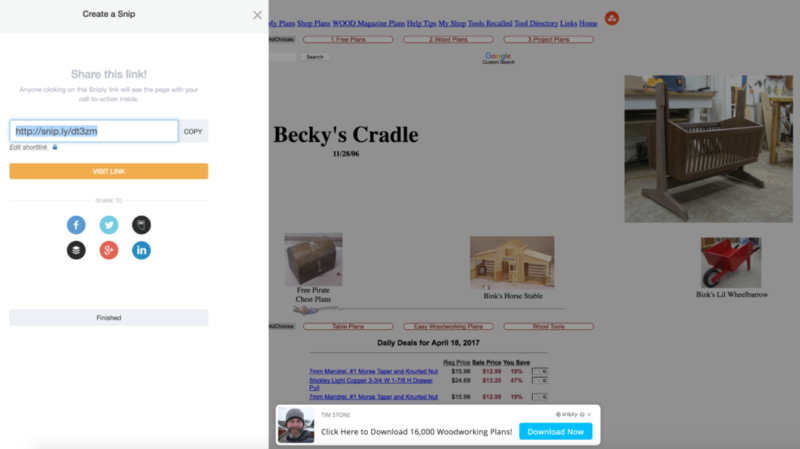 Now, anytime anyone clicks that Sniply link… the baby cradle page is displayed with my affiliate ad overlay on top of it. Be sure you copy your new Sniply link to your clipboard before moving on. I know, I know. There’s a lot of pinning and snipping going on. I promise it’s not confusing once you’ve done it a couple of times. Just refer back to this post if you get lost. The next step is to pin the page you just snipped. For this example, I’ll choose the third image from the left in the top row. Next, I’ll pin this page to my Kids Wood Projects board. Click the “See it now” button to view your recent pin. Click the pencil icon at the top left and edit your new pin. Now, replace the existing website URL with your new Sniply link that’s copied to your clipboard and click Save. Now, whenever anyone clicks the “Read It” button to visit this page… they’ll see my affiliate ad overlay too. Now THAT’S pretty sweet, right?! You’re probably wondering how well this works and how many people click the affiliate ad. Well, like I said… I didn’t spend much time on this at all. I just wanted to be sure my idea would work. You can see I created 71 Sniply links. Those 71 links received 176 clicks… meaning 176 people clicked the “Read It” button from my Pinterest boards. Of those 176 clicks, 4 people clicked my affiliate ad overlay for a 2.27% CTR (click through rate). Sniply calls the click-throughs conversions because that’s my chosen action for this campaign. They also allow you to collect email address right from the overlay if you want. And, you can track conversions to sale if you’re selling your own product. Just to clarify though, the conversion rate of 2.27% in this example is really my click through rate. Most media buyers would KILL for a 2.27% CTR on their banner ads! Let me remind you… this is 100% free traffic. Didn’t cost me a penny. Just the time it took me to pin those items. Now, those 71 pins will generate free clicks to my affiliate links on complete autopilot for months, or even years, to come. Just think… how many free clicks would I get if I had 500 or 1,000 pins like this? Yep, I’m gonna take this one step further. If you want to reap the full rewards of this free Pinterest traffic… don’t pin other people’s websites. Instead, curate other people’s content, put it on your own website… then pin your own website. If I had done this with my test campaign above, I would’ve received 176 free clicks to my website… PLUS, 4 clicks on my affiliate link. Those 172 other people who didn’t click on my affiliate link might’ve clicked another ad on my site or maybe would’ve opted in to my email list to receive a free download. DISCLAIMER: Be sure to give credit appropriately when curating other people’s content. Hopefully this post has opened your eyes to potential Pinterest holds. Most marketers dismiss it (like I did) as a place women go for recipe ideas and DIY crafts. Pinterest is a massive, untapped traffic source… put it to work for you! Questions, comments, suggestions? Leave them as a comment below… I’m happy to help! Hello. Does your new ad overly method comply with FTC affiliate marketing disclosure regulations? Thanks. I’m not a lawyer so don’t take this as legal advice… since you don’t own Pinterest, or even the page you’re putting the overlay on, there’s really no way to disclose that you’re an affiliate. Affiliate disclaimers are meant to inform website visitors that your opinions and recommendations may be biased because you’re making money from them. It’s really no different than placing a banner ad on someone’s website and earning a commission if someone clicks and buys. Again, I have no clue how the FTC feels about this and I would recommend checking with an attorney before partaking in any kind of business. There is no “website” to add my link? Make sure you’re editing something you’ve already pinned. You can’t change the URL until you’ve pinned it to one of your boards. On-going traffic is the reason I spend the time to pin them in the first place. As people continue to repin them, I keep getting traffic. Great. That’s what I was hoping to hear. I’m thinking of using pinterest to drive traffic to my cat/kitted blog. Have been doing it almost entirely with Facebook, but their ad costs are getting way too high. Any tips on how many pins to do a day for maximum effectiveness? I would do at least 20 a day but the more you can do the better off you’ll be. Very nice article. I was very excited because i somehow i cant get my affiliate links from clickbank not posted. Very strange. I thought your new method would be the answer but no i even get the message its a spam link. So right now i cant post any affiliate link to Pinterest not even with your method. Have you any idea whats the problem? And your new method… I still asking myself how its works. A new pin of a not affiliate gets a snip where you have your affiliatelink. But doesnt that mean that everyone who want to read more from that new pin now only sees the affilate page with the snip because we added this snip page/link? Or i am wrong here? 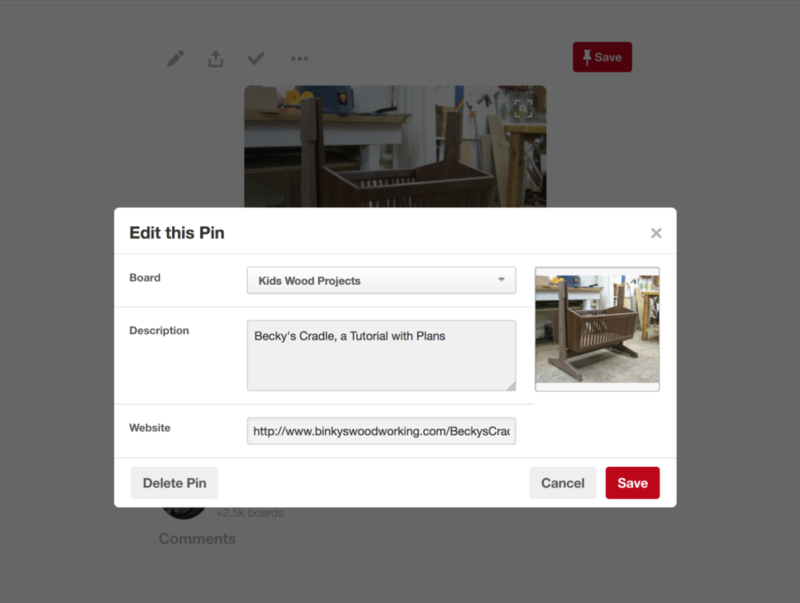 You can’t use your affiliate link directly on Pinterest. That’s where Snip.ly comes in. You “snip” the content page that you’re pinning and your Snip.ly link has a call-to-action button that includes a promotion for your affiliate product. Is this method still working? I might be doing something wrong? It’s not working for me. I’m a Clickbank affiliate so I would really appreciate more info. Thank you! Yes, this method still works the only snag now is Pinterest recently blocked the snip.ly domain so you either have to pay for the paid snip.ly account and use a custom domain or you can use this tool here which does the same thing. Hello Duston i liked your article and i think is a great marketing tool, but i wanted to ask you about this other tool i was checking out Lead Grab that you suggested…is this allowed on Pinterest now? or now only paid snip.ly account works with custom domain? Pinterest should have no problem with you using LeadGrab because you’re using your own custom domain name. Too many people abused the Sniply resource so they stopped allowing that domain. Thanks for the info on leadgrab but I cannot tell if the cost of leadgrab is a one time purchase or a monthly fee or a yearly fee. Also, is it for only one domain or more than one. Does there have to be a website on the domain? Jeeez. Leadgrab should have a FAQ page. The cost is a one time purchase. I’m honestly not sure how many domains it comes with. There doesn’t have to be a website at that domain. I think to escalate this strategy you can use an auto pin scheduler (like for ex. tailwind or board booster) to automatize and maximize the odds of conversions. Alternative to sniply you have backly, i think they had a free plan but i don’t know if they have it anymore. They are very identical but i think backly its cheaper. Great stuff you have in this article. You can’t use the raw Sniply or Bitly links. You have to use your own custom domain. Sniply offers a paid plan where you can use your own domain or you can get this Sniply Alternative. Be sure to give credit appropriately when curating other people’s content. Thank you very much for your help and time!!! Instead of writing content yourself, collect good content from around the web and put it on your site but be sure to give them credit by linking back to their site. Therefore your domain name is still part of the url that you type in Pinterest so Pinterest isn’t flagging it or not letting you use it. It’s worked for my Clickbank affiliate links. So I am not sure I understand the part where you say that Pretty Links doesn’t work. Just did this using Pretty Links on Pinterest a week ago. Pretty Links works perfectly fine when you’re pinning your own content or even an affiliate product. But when you want to pin other people’s content, there’s no way to put an offer in front of people who click on something you pinned from another person’s site. That’s what this strategy is all about.